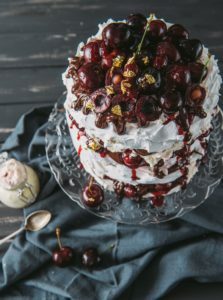 This recipe for my indulgent dark chocolate and cherry pavlova tower is the perfect showstopper for any christmas party, and with a few tweaks to the toppings, pairs up as the ultimate summer bbq pudding, The key to a making a great meringue is super clean equipment, fresh eggs and room temperature and hot sugar! Place caster sugar on a lined baking try and bake in a 220ºc oven for 5-7 minutes until the edges start to melt. This helps to create a glossy, stable meringue without having to add anything else into the mixture. Place the egg whites into a clean mixing bowl and whisk slowly until bubbles start to form. Increase the speed and whisk until the egg whites form stiff peaks. Carefully spoon in the sugar a spoonful at a time and continue to whilst for around 7 -10 minutes until thick, glossy and smooth. Take 4 pieces of greaseproof paper and trace around a 20cm cake tin base on each one. Turn upside down and place each piece of greaseproof on a baking tray. Divide your meringue mixture into 4 and spread into 20cm circles saving a little extra to create peaks for the top layer of your pavlova. Bake in a 110ºc oven for 30 minutes before turning off the oven and leaving for 2 hours to cool and dry out. Place 2 saucers into the freezer. Roughly chop a third of the cherries and place in a large pan with the remaining stoned cherries, 150ml water and the lemon zest and juice. Gently bring to the boil before reducing the heat and leaving to simmer for 20 minutes. Stir occasionally until the cherries are softened. Add the sugar and stir until dissolved. Increase the heat and boil hard for 4-5 minuted until the jam is softly set. To test this, take one of the plates from the freezer and spoon a little of the jam onto it. If the jam wrinkles when pushing your finger through it, it’s ready. If not reboil for a few more minutes and then retest on the other plate from the freezer. Store in clean, warm jars that are placed in the fridge until you’re ready to use. In a large bowl, whip the double cream and fold through 2tbsp cherry jam to create a ripple effect. In a separate bowl, gently melt the dark chocolate over a pan of simmering water. Once you’re ready to build your pavlova place the first layer of meringue on your serving dish or cake stand. 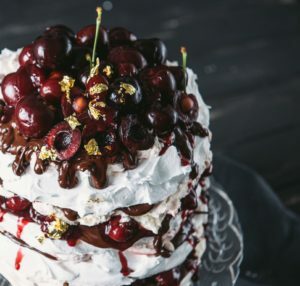 Spread over a generous amount of cherry jam and drizzle with melted chocolate before spooning on a quarter of the whipped cream. 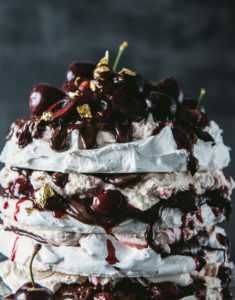 Place the next layer of meringue on top of the cream and repeat adding the jam, chocolate and cream until you reach your top layer. Smooth over with chocolate, jam and a little cream, before dressing with fresh cherries. To serve, we’ve added a splash of edible gold leaf, making the perfect centrepiece for any event or party.